6th studio album from all-female Japanese pop-rock band SCANDAL. Selling over 35,000 copies in its first week release on Japan, also debuted at number 3 in Oricon chart. 13 songs from this album are SCANDAL way to say "HELO" to their global fans. Already out in Japan in December 2014, JPU Records brought this awesome album to Europe in January 2015. With this overseas edition, they held a World Tour from January to May 2015. And there is also a Documentary Film of Hello World, subtitled in English and Spanish. Something unique from this album, because there three songs that Mami, Tomomi, and Rina become lead singer. Mami with Hon wo Yomu (Read a Book), Tomomi with Kan Beer (Canned Beer), and Rina with Oyasumi (Good Night). Four songs can be previewed from their SCANDAL4VEVO YouTube channel, two of then are : Image and Depature. This album feels like pop-rock meets punky style. And for those who fallen in love upon listening 2 songs from their YouTube channel, there are also two bonus tracks, Rainy and Nai nai Night 2014, from European Edition of this album. 1. 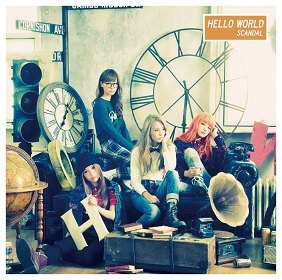 Document Video "SCANDAL Taking about 'HELLO WORLD'"